Two hearts joining as one is a perfect way to symbolize your special day. 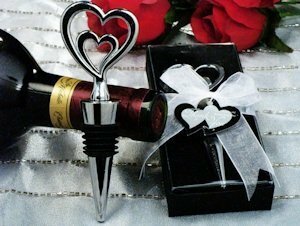 This double heart bottle stopper makes a useful and elegant gift to give your guests. They will be reminded of your special event with every use. Each favor has a chrome metal double heart design attached to a metal base. Ready for gift giving, the bottle stopper wedding favors come packaged in an elegant black gift box with velvet lining and wrapped with an organza ribbon. We've also attached a double heart shaped thank you tag making them the perfect guest favors for a wedding. Each bottle stopper measures 4" long.